Cufflinks Swarovski Black Diamond Crystal 9 Cube Square 15mm Square Cufflinks by Gemini London. Swarovski Crystal Cufflinks. 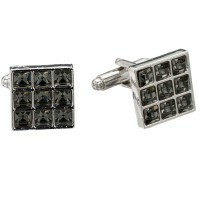 15mm Square Cufflinks made with Black Diamond Swarovski Crystals. The crystals rectangle cuff end is 15mm x 15mm and sits 2.5mm proud. Comes in Black Gift Box. The crystals rectangle cuff end sits 2.5mm proud. You're reviewing: Cufflinks Swarovski Black Diamond Crystal 9 Cube Square 15mm Square Cufflinks by Gemini London.